Our Deep Blue “Map” jersey has style highlights on the rear pockets and the arm grippers, of the Galibier, southern climb. The relief Map pictures the ascent from Bourg d’Oisans. The light, summer garment weighs in at less than 170 grams and uses the 6, focused fabrics in the construction. The side panels constructed from light, Italian Airmesh fabric with the Half length sleeves using the latest material from Miit. The special structure of the fabric creates larger surface for the moisture to evaporate on the outside to creating a drier climate. A full YKK zip, gives additional adaptability as the sun rises and the low profile collar adds to the hot weather focused design. 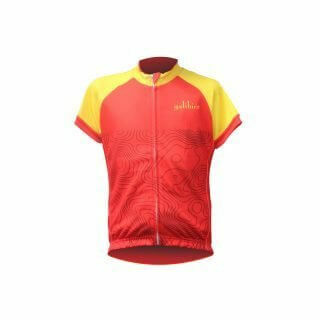 The jersey features a deep, angled and reinforced pocket structure, with an extra security pocket and two 3M reflective panels to keep you visible in low light. The jersey uses a dual fabric silicon waist gripper allows the jersey to be loaded up without it losing shape on the bike.